NEW YORK (AP) — In a story Sept. 26 about Ecuadorian President Lenin Moreno’s views about Wikileaks founder Julian Assange, The Associated Press reported erroneously that Assange over the past two years had continued to hack the accounts of politicians around the world. It should’ve said Assange had published material from hacked politicians’ accounts. 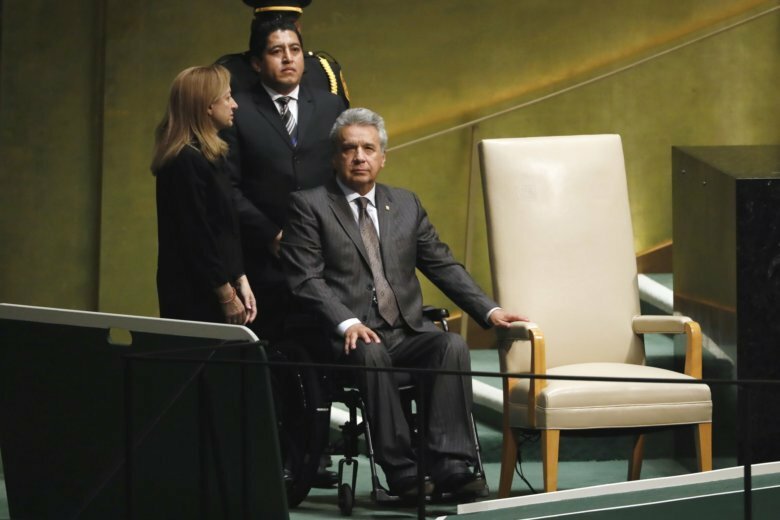 President Lenin Moreno told The Associated Press that Assange’s lawyers were aware of the negotiations. He declined to provide more details because of the sensitivity of the case. Assange has been holed up in the embassy for more than six years. The famous whistleblower and computer engineer faces an arrest warrant in the U.K. for not making a bail payment and fears he could be extradited to the U.S., where high-level officials have spoken about prosecuting him for stealing classified information. Previous sexual assault charges filed against him in Sweden have been dropped. Moreno said his country will work for Assange’s safety and the preservation of his human rights as it seeks a way for him to leave the embassy. Ecuador’s previous left-leaning administration gave Assange asylum in 2012, saying it feared his life was in danger for publishing thousands of diplomatic cables that put U.S. officials in a difficult position. But Assange’s relationship with the Ecuadorian government has soured since the centrist Moreno became president. Over the past two years Assange’s access to the internet was suspended on several occasions, as he continued to publish material from the hacked accounts of politicians from different countries and made controversial statements on his social media accounts. Ecuador’s government has said Assange’s activities in the embassy, including the publishing of thousands of Hillary Clinton’s emails prior to the 2016 election in the U.S., have compromised its relations with other countries. Assange has long argued that he is simply monitoring the actions of some of the world’s most powerful politicians and exercising his right to free speech.